Teacup dimensions have quite a wide range. Some are really small and others are rather big. 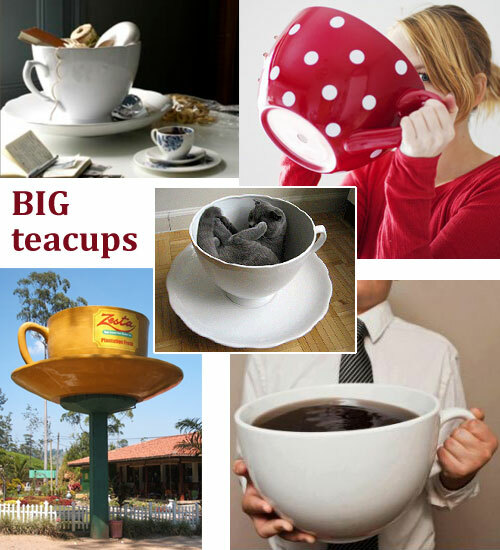 More BIG teacups have popped up online on social media sites, prompting me to do a bit of searching around to see what I missed in my previous article on the subject. Setting aside the cups large enough to hold a person and used for amusement park rides and party attractions and the ones used for business signs (especially appropriate for tea plantations like the bright yellow one shown below), there are plenty of teacups that can really be used for tea and that are quite generously proportioned. These huge teacups don’t always get used for tea, even though they could be. Sometimes they are table décor, holding anything from craft and party supplies to a host of treats for nibbling while you and your guests imbibe your tea from more normal sized cups. Others are used as planters, holding profusions of brightly colored geraniums, pansies, or other planter favorites. Sometimes kitties take these over before you can plant anything in them and use them for their 20 hours per day of nap time. Don’t steep a sipper tea, go for a gulper tea instead. Steep the tea up stronger than usual. Add in any milk, sugar, honey, etc., in amounts proportional to the cup volume. Wear a bib while drinking. Have a friend or family member help you lift the full cup. Have lots of “biccies” (Brit for biscuits, which we call “cookies”) handy. Are you up for that giant cup of tea? Great! Put that kettle on and start steeping!